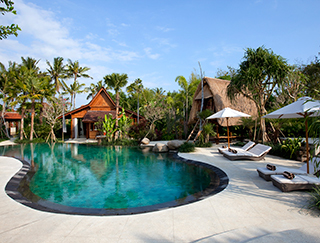 Four glorious residences – three 4-bedroom, one 3-bedroom and a 1-bedroom villa – make up the Dea Villas estate, an exclusive enclave five minutes from Berawa Beach and only 15 minutes from the buzz of Seminyak. Each is secure in its own garden with pool and outdoor pergola or balé, and enjoys shared gym, spa, and children’s playground. Each has its own character and style, from ultra-contemporary to whimsical heritage chic – enriched with hi-tech facilities including iPod docks and home theatre systems. Best of all, they can be rented separately or together, meaning Dea Villas can accommodate guests in many combinations, from a honeymooner couple to two families in adjoining villas right up to 40+ residential guests for a wedding celebration. 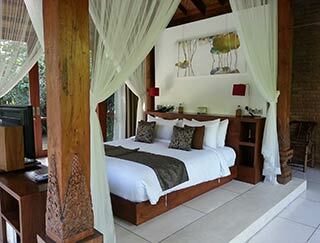 Villa Sati comprises a series of individual pavilions, well screened in delightfully established gardens. The largest of these is the open-sided living pavilion, which looks over an amphitheatre style performance space near the large free-form swimming pool. 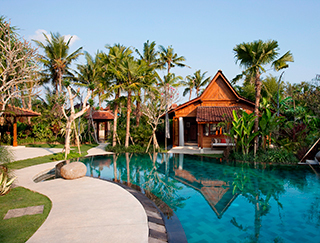 Encircling the pool are four joglo pavilions, each housing a bedroom with garden bathroom and sun terrace. Among these is the sixth and smallest building – an antique lumbung (traditional rice barn) which doubles as a playhouse.